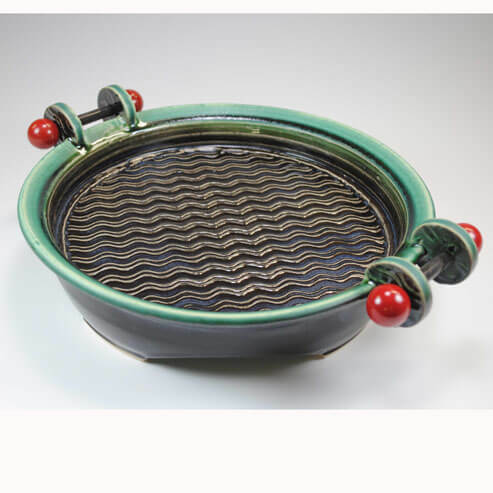 Jonathan Kaplan has enjoyed a career in the ceramic arts for over 40 years. He earned his BFA from Rhode Island School of Design followed by an MFA from Southern Illinois University at Edwardsville. artist, a professional mold and model maker, a ceramic designer, and manufacturer. He has written extensively for Ceramics Monthly, Pottery Making Illustrated, Ceramics Technical, Ceramics: Art and Perception, and Studio Potter. Jonathan’s work has been featured in the Lark Books 500 Series, and he has recently been honored to be included in the “Best of 500 Ceramics” and the soon to be published new edition of “500 Teapots”. Jonathan serves on the board of Studio Potter, curates Plinth Gallery in Denver Colorado, and is Instructor of Record at Adams State College. Architecture and geometry have been an influence throughout my career as a ceramic artist. Designing and making ceramic work is a process similar to the methodology of creating structure in architecture. I am also intrigued with the concept of parts and wholes: creating a complete structure with the combination of singular, or individual parts. These ceramic constructions are combinations of ceramic parts melded into a very complex finished object. To develop these forms, I use doubled textured slabs, wheel thrown sections, press molded spouts, donuts, or animal forms. The addition of machined industrial parts and fittings, the final element of “parts and wholes,” offers a visual and structural counterpoint to the handmade qualities that are evident in clay.